Well as many of you know I quite my job at the end of last month to become a stay at home mom so I could homeschool my kids.Our homeschool year by attending the South East Homeschool Expo here in Georgia. I will be writing a blog post about that later this week so be on the look out. Due to the kids being sick we started school on Tuesday. We are easing our way into the many new changes this month so our week was not super structured but the kids did start adapting to their new routine and the fact that mommy is now home! We are using an eclectic approach to our curriculum and will be incorporating some unschooling philosophies. We will also be taking many field trips (hands on learning is the BEST). So here is our week in the life of homeschoolers update week 1! Each morning the kids complete their morning checklists before they come out for breakfast. I am amazed at how quickly they caught on. they must complete before coming out for breakfast! After breakfast the kids complete their chores and then we start school around 9:00 am by discussing what the date is, what day of the week it is and what the weather is like outside. Our calendar and chore chart. Tuesday: Since it was a monumental day the kids each received a special gift, backpacks filled with some goodies. They also got to hold up their welcome signs. We soaked our mushroom in a box (I picked this cool little thing up at the expo). And then kids were then introduced to their workbox system. They completed puzzles, matching games, workbook pages and read stories. And I had my very first proud mommy moment. 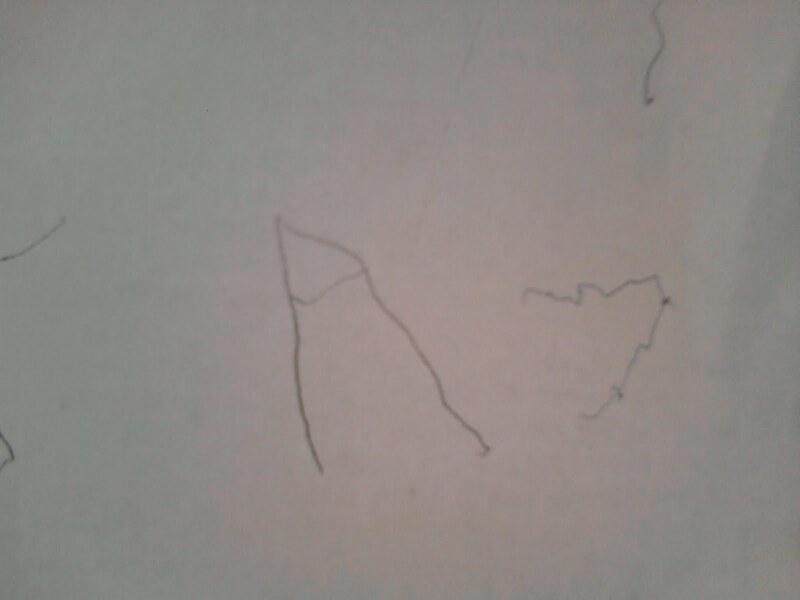 My 4 yr old son wrote his very first letter "A". Wednesday: We went on a geocache adventure with some homeschooling friends. We didn't have much luck though. We tried to find 3 different caches but only has success with one. Afterwards the kids (well mostly Gwyn did a nature study). Thursday: We went to the library and checked out 16 books, videos and cassette tapes. The kids had fun time. Who would have thought you could have so much fun at a library? We then went home and started our Handsome Horse Unit Study by Amanda Bennett. Rowyn colored some horse coloring pages while Gwyn and I worked on the unit study. We completed several pages and watched the online videos. Then the kids watched two horse videos we got at the library, "Eyewitness Horse" and "National Geographic Really Wild Animals Farmyard Friends." Mommy snuggled with the kids and napped while the videos were playing. We then had a lunch fit for a horse, carrots and apples. After lunch we read some of our horse books. Gwyn really enjoyed, "Black Beauty." Friday: We went to a friends church to help make bagged lunches for the homeless. I helped make the peanut butter and jelly sandwiches and the kids helped to put the water, sandwiches, apples, chips and snacks into plastic bags. Afterwards we went home made our large Giraffe craft, put the map puzzle together and the kids helped make dinner. The kids also took turns measuring each other on the Giraffe. Saturday: Yup we are homeschoolers so we occasionally have some lessons on Saturdays! Today we went to the FREE Home Depot Kids Workshop and the kids each made a pencil box. I didn't think Rowyn would be able to REALLY make it on his own but he did. I was so impressed with how they glued, hammered and painted. Next month Home Depot Kids Workshop is making a memo board. Did I mention its FREE!!! they also get a cute apron, pin, sticker, certificate, coloring page and of course the item they made.Since it was actually cool today (all week it has been in the 100's) I took the kids to the playground. And of course there are still chores to do on Saturday so the kids brought out their laundry, sorted it and put it into the washer. And that is sums up our first week! a fun filled week! Thanks for linking up, we keep saying we are going to try some geo caching, it came up again yesterday... I think it's a sign ;) We def have to do this! Following from the Field trip Blog Hop. We enjoy Geocaching...haven't done much this summer though because of the heat. Waiting until Fall to do more. Have fun this school year!! Absolutely wonderful....I hope our first week is just as fun. This will be our first year and I have a 1st and 4th grader. You are an inspiration. How do you find geocache info? @KarenI have a post on blog talking about how to get into geocaching, http://www.kathysclutteredmind.com/search/label/Geocaching. Welcome to homeschooling! YOu are off to a great start. We are in our 13th year and love it so much.